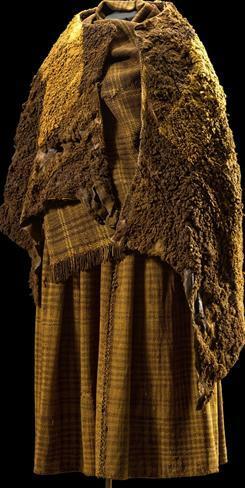 A costume dating back to the Pre-Roman Iron Age. Scholars have long tried to make sense out of one of the oddities of the archaeological world —bodies pulled from ignominious burials in cold water bogs everywhere fromIreland to Russia. "Unfortunately the focus has been almost exclusively on the most spectacular finds, the mummified bodies," saysarchaeologist Moten Ravn of Denmark's Viking Ship Museumin Roskilde, writing in the current Acta Archaeologica journal. Rather than arguing from just one body, Ravn suggests a survey of all the bodies might offer better clues to how they ended up buried in bogs. Acids found in bog waters have mummified some of the bodies, or more accurately tanned them into leather. Mosses release chemicals that leach calcium from the bodies, "which means that the bones of the bog bodies take on the consistency of rubber," Ravn writes. Other bogs rich in lime have preserved other bodies only as bones. Scholars have raced up and down the human pecking order in ascribing identities to the bodies. The historian Niels Petersen in 1835 decided that the "Haraldskaer" woman's body found at the site of a copper factory belonged to the Norwegian Queen Gunhilde, drowned by King Harald Blatund (Bluetooth) in the Ninth Century. By 1907, archaeologist Johanna Mestorf became convinced they were all executed criminals, noting many of the bodies were bound and naked. Shades ofRaiders of the Lost Ark, Nazi archaeologists dominated bog body research starting in the 1930's until the end of the Third Reich, Ravn notes, "interested in proving that the so-called Nordic race were direct descendants of the proto-Germanic race," dating back to the Bronze Age. As for executed criminals, Ravn notes there are only 21 Danish cases where the bodies have demonstrably been restrained, which, "may be a general protection against ghosts and not something reserved for criminals," he writes. About 34% of the Bronze and Iron Age bodies in his sample are clothed, and clothing may not endure in bogs as well as flesh does, explaining its absence. A 2009 study, also in the Journal of Archaeological Science led by Ulla Mannering of the University of Copenhagen, reports 44 instances of bog bodies found with clothes in Denmark, most dating to the Roman era. The Nazi theory is just crackers, of course, with even their own archaeologists pointing out bog bodies turned up in Ireland and elsewhere, even as far south as Crete, far outside any "proto-Germanic" home. Instead, "most archaeologists today support the sacrifice theory," Ravn writes. Proposed in the 1950's, the basic idea is that bog bodies were mostly offerings to the Nordic gods Odinor Nerthus ("Mother Earth"), with the rest either murder or accident victims. People were mostly cremated in the era, a point which suggests a bog burial must have been a special event. Ravn proposes a new theory to explain some of the bog bodies — maybe they were just people who died of natural causes and were sent to their burial in the bogs by their relatives. There is nothing special about the range of 145 people in his survey, men, women, young and old. Some were clearly placed in excavated holes lined with bark and cotton, buried with glass beads or gold jewelry in their mouths, a Roman custom. In Celtic myths, bogs and lakes were places of healing, Ravn suggests. "Is it possible that there was a wish to pass on these healing characteristics of the bog to a person who died a natural death so that the deceased could arrive healthy in the realm of the dead," he asks. Overall, bog bodies are "not so easy to explain," Ravn says. The oldest one, the Koelbjerg woman, dates to 10,000 years ago. Others date to modern times, such as Johann Spieker, a hawker (person who used trained falcons to hunt), who died in 1828. "The reason that people were given their final resting place in the bog was not because of any one single tradition or one single ritual," Ravn concludes. "Some were due to accidents and others to murder. Some may have been sacrificed and others may have died of natural causes and were buried in the bog."